Are you going to be the bridesmaid at an upcoming wedding? Then, here are a few fabulous outfit ideas for you to choose from! Being a bridesmaid is fun yet a job full of responsibility. She has to be at the bride’s disposal 24×7. This means, that even though she needs to do a lot of work to make her friend’s wedding an affair to remember, at the same time, a bridesmaid got to look stunning too! That’s why Zuri brings to you 19 latest and stylish outfit ideas that are easy to carry and are trending at the moment. Lovely sarees, ethnic crop blouse-skirts, traditional lehenga cholis with a twist, the collection for this year is amazing. The colors for this year are soft, subtle, and dreamy, such as seafoam, peach, light mauve, aqua-blue-green, chalk-y blue, carrot red and lime yellow. Even bolder shades such as maroon, midnight blue and bridal red can be flaunted in style. Fabrics too are truly magical. Rich and shining. The intricate or light embroidery is further enhanced through the careful selection of motifs, which can range from paisleys to peacocks to quirky ones. Set against a single-tone or a floral printed fabric. If there are atleast 2 bridesmaids, then the color of their outfits can be different, however, the style can stay the same. Their outfits can also be aligned with that of the bride. Just that the bridal lehenga ought to be far more embellished than that of the bridesmaid. So, here are a few options for all you lovely bridesmaids out there. For for an elegant aqua color lehenga choli, accentuate your figure with a net fabric. Team it up with a net dupatta with heavy work. You can also opt for a raw silk fabric (minus the dupatta). Another fabulous color combination is that of peach and mint green. Light and gorgeous, go for a peach embroidered lehenga with mint green cut work blouse and another contrast color for a dupatta, maybe a mustard-yellow or orange? We have also got you another style in similar color range. 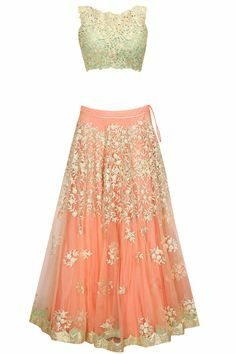 A pink-ish peach mermaid lehenga-sari in chiffon with sophisticated lace applique work. To add glamor to this outfit, you can opt for sheer net embroidered sleeves or just go sleeveless! 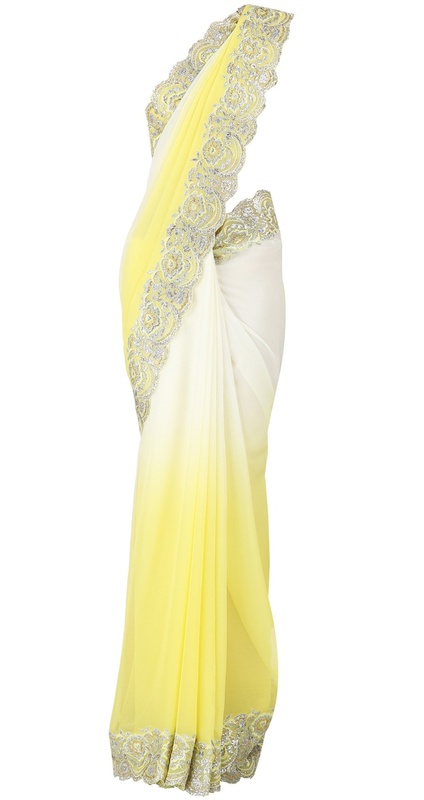 A unique outfit for dusky bridesmaids is a lime/lemon green lehenga choli in net fabric. Have mirrors or resham embroidery to further enhance the color and style. Try out a boat neck and three-quarter sleeve for the winter wedding. If you are looking for a something unusual, then Zuri recommends full-sleeves, mirror work on the cuffs and minimalist makeup/accessories. A cape-blouse for a choli is quite unique and extremely bohemian. So, for a dash of quirk, try it out on a sleeveless choli. This wedding season, have fun girls!